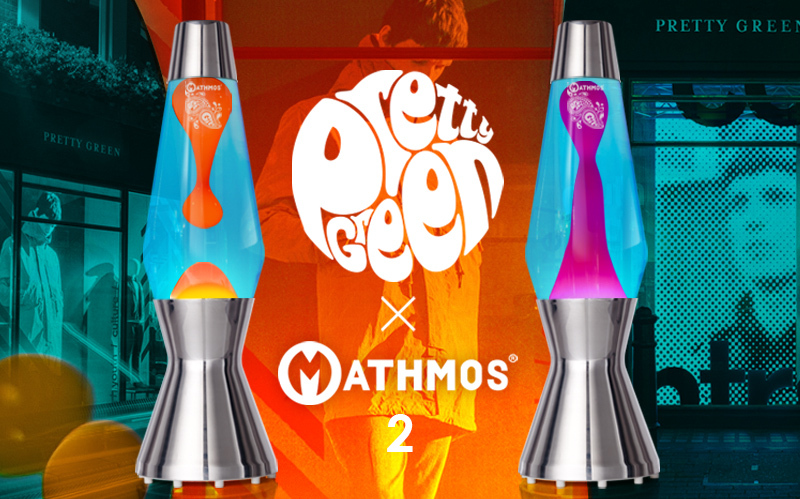 The second collaboration between British fashion brand Pretty Green and Mathmos; inventors of the lava lamp. We have created two new variants of Mathmos’ classic astro lava lamp in a limited numbered edition of 400 pieces. Mathmos’ only limited edition this year. The edition is strictly limited to 400 pieces. Numbers 1 – 200 are blue/orange and 201-400 are blue/pink. There is a numbered gold sticker on each box. The box is hand drawn in house at Pretty Green and is inspired by the graphic art of 1960s psychedelia. This year’s box weaves in the limited edition message and unique numbered sticker and is updated with the two new colours for 2018. The glass bottles are blown and etched in Yorkshire. The remainder of the lamp is made in Dorset; the metal bases parts are hand spun, the bespoke boxes printed and at the Mathmos factory the bottles are hand filled, tested and packed.